This year’s Blue Ribbon College Basketball Preview on Rhode Island (ESPN Insider) says this of the Rams’ chances this year. 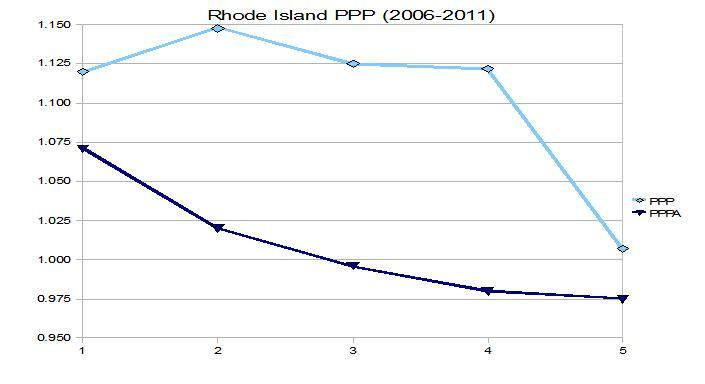 If you’re going to pick against the Rams this season because they lost two of their top three scorers to graduation, be warned: Rhode Island has lost seemingly irreplaceable pieces the last two years and improved their win totals. But if you’re going to pick against the Rams because of their suspect defense, you might have an argument. These words were written by Nate Crossman of Blue Ribbon. Wow, was he wrong. The conclusion he came to was not out of the ordinary, I may have made the same analysis. Over the past five seasons, URI has had one of the best offenses in the Atlantic 10 and the Rams have been able to make up for critical losses of major offensive pieces. What has happened so far this season is exactly the opposite of what Crossman describes. Rhody’s defense has been stout but the offense has been porous. Consider this graph. The dark blue line represents the points per possession allowed for the past five seasons under head coach Jim Baron. As can be seen there has been a downward trend ranging from awful in the 2006-07 season to good the past two seasons. The key difference over the past few seasons is an increase in forcing turnovers. The Rams’ national rank in turnover rate in these two seasons have gone from 321st to 184th to 144th to 49th to 76th. This trend essentially matches the improved defense overall. It seems that the marginal improvement between the 2009-10 season and this year is an improved effective shooting percentage. URI went from giving up a 50.9 eFG% to a 48.1 eFG%. Considering these metrics, Baron has made great strides to improve his defense to go along with his usually efficient offense. Baron has studied the Phoenix Suns, the University of Missouri and the old-school Loyola Marymount teams of Paul Westhead to try to master the nuances of fast-paced basketball. Despite this characterization URI’s defense has never been that fast paced. Last season Rhody averaged 68.2 possessions per game ranking 126th and this year the Rams have posted 67.5 possessions per game ranking 133rd. That tempo is not representative of a Mike D’Antoni seven seconds or less offense and certainly not an example of a Paul Westhead four seconds or less offense. Duquesne has routinely averaged under Ron Everhart much faster paced teams. I would not describe the Rams as a run and gun team but rather a program with a very efficient quicker than average offense. When the Rhody offense was at its zenith in the past few seasons one dependable bright spot was offensive rebounding. Baron’s Rams never ranked more than 64th in offensive rebounding rate and as high as 28th. This season URI is placed 181st in offensive rebounding. That combined with poor three point shooting point to what ails this normally potent offense. This season it has been up to leading scorer Delroy James to create on offense. James is a 6’8” small forward who can be described as Chris Wright but good. James is likely to touch the ball on every possession as evidenced by his high usage rate (he ranks 29th). The forward is an able slasher, quality offensive rebounder, especially for a three and a decent passer. The only thing is he can’t shoot well from long distance. James’ ability to get to the rim could be better used if Rhody shot better than 31.8 percent from three, but this team cannot seem to utilize the space James creates. This year’s URI club is not a typical collection of Jim Baron players. Generally, an efficient offense is the mark of the program but this season it is the defense doing the dirty work. Baron may have learned something from studying the fast paced offenses of Paul Westhead but it also seems that he has paid attention to how a quality fast paced defense operates perhaps by watching Everhart’s teams at Duquesne. Up-tempo teams win by creating turnovers. Rhody has successfully done that this season and their 16-10 record demonstrates that. If left up to the offense, this team would be lucky to be .500.